Rub Ons Used With Various Rubber Stamping Techniques Help You Make Fabulous, Individual Cards, And Add Delicate Detail To Your Scrap Pages. Wow. Rub Ons combined with other stamping techniques give you such a professional finish. Stampin Up® has included some fabulous Rub Ons in the Idea Book & Catalogue for 2008, and as an added bonus you will find 2 more sets in the Spring Mini Catalogue. They are sheets of images that you place on a surface such as paper, ribbon, glass - in fact most surfaces - and rub gently with a paddle pop stick to transfer the image to the desired surface. It's a bit hard to explain so look at the images in the Spring Mini Catalogue on pages 6 and 11. Each pack has one sheet of black and a sheet of white images. You just select the image you want to use, cut it out, (including the backing sheet) position the image exactly where you want it and rub over the front with the paddle pop stick to transfer the image. HINT: Peel the covering paper back gently - sometimes the entire image is NOT fully transferred. HINT: After removing the covering paper, press gently on the image to ensure good adhesion to whatever host you are decorating. You can use lots of Rub Ons in a project or you can use just one word. That depends entirely on the effect you want to achieve. You can combine Rub Ons with most other stamping techniques - using them as a focal point of your design. My first card uses the very versatile Polka dot Background stamp (page 108) IB&C 2008-09, the flower stamps from One of a Kind and the Boho Blossoms Punch both from the Spring Mini Catalogue. The words and white flowers are Rub Ons. Other Stampin Up products used include: Bashful Blue, Whisper White and Certainly Celery card stock. White Craft Ink, Matt Pack, White Gel Pen, Regal Rose 1.6cm Grosgrain Ribbon, & Soft Subtles Brads. I wanted to make a black and white card with lots of detail, and using the Rub Ons made this a quick solution. I love the graphic quality achieved by using black and white and find that combination always looks smart. 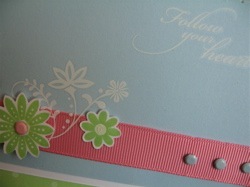 I cut away the front of the card so that the beautiful intricate flower border could be seen. Ribbon - both black and white gingham and black grosgrain were used. 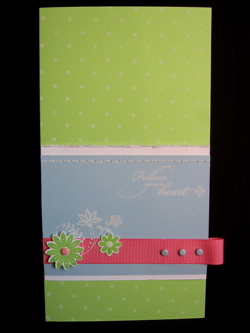 The white gel pen makes small dots below the ribbon and helps to tie the design together. 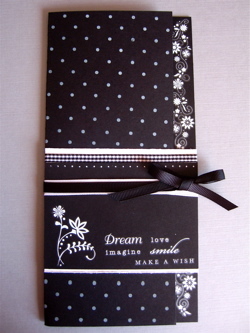 Again the polka Dot Background Stamp was used with White Craft Ink.